General development info is available on the our CVS News page, GNU-Darwin ports instructions, and Darwin porting tips. To monitor breaking development news, try the Ports forum via email or the RSS channel, which is also shown in the newsbar to the right. 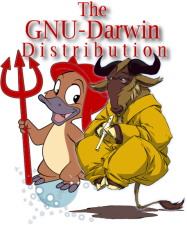 GNU-Darwin: No More Oily Congress! URGENT: Log a call against telecom immunity!